JetBlue asked HLW to create a unique fusion of the company’s branding with modern, sustainable design. 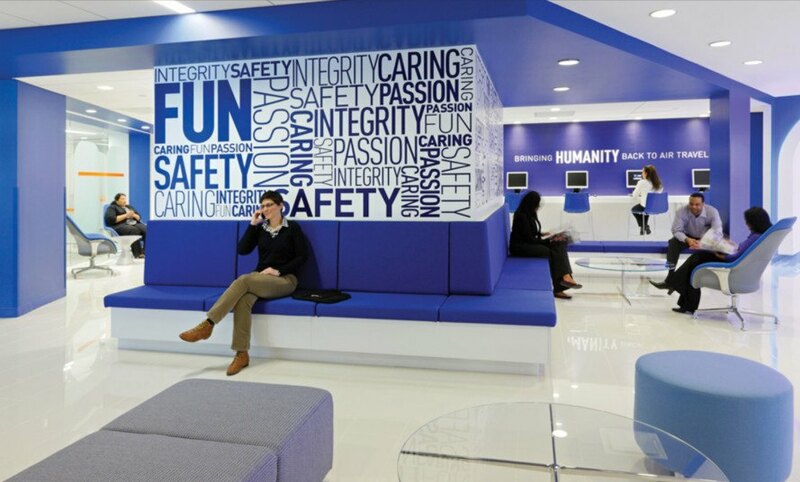 The resulting space has the aerodynamic lines of an airplane meshed with JetBlue’s corporate mantras and green principles. The entire office was designed to play up natural light in an attempt to not only create an open working space, but to also cut down on electricity consumption. Clear glass office cubes help to create an airy flow, while motion sensors keep lighting costs low. Each floor was outfitted with sustainable office furniture and carpeting made from recycled and LEED-certified materials. During construction, the team recycled 90% of demolition waste, while also reusing elements like ceiling tiles, duct work and sprinkler pipes. An office-wide strict recycling program keeps paper consumption down, and LEED-certified cleaning products keep the offices responsibly clean. Finally, the workplace’s Long Island City location adjacent to several train lines promotes green transportation.